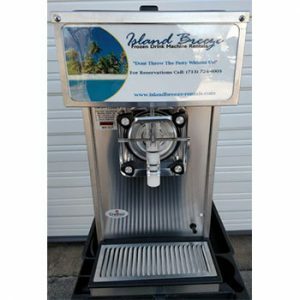 Make your party a smash hit with an Island Breeze Frozen Drink Machine. With over 30 machines in stock, we usually only run out of machines on weekends during May, June, and some Holidays. 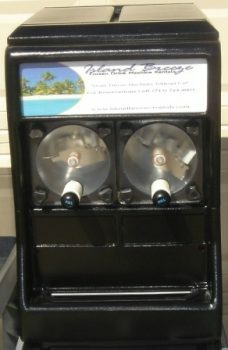 Our frozen drink machine rentals aka margarita machine rentals allow your guests to serve their own frozen drinks. Do not rent our competitors plastic bowl frozen drink machines that can take up to 3 hours to freeze the mix and 2 hours to refreeze your refills. Those machines do not even work outside when the temperature is more than 80 degrees. You will regret saving a few bucks with those plastic bowl machines. All of our machines are refillable so you never run out of frozen drinks and they all work outside in the summer heat (machine must be placed in a covered area). Plastic bowl machines are granita machines that make a coarser, more crystalline texture drink versus a frozen drink machine like ours that makes a smooth textured drink! If you want a Real Lime Juice/Lime Extract mix, then upgrade to our Ultra Premium Top Shelf Lime Margarita mix for $10.00 extra. We also offer the Ultra Premium Top Shelf Gold mix with Real Lemon/Lime Juice and Lemon/Lime Extract for $10.00 extra. The Gold mix offers a balanced taste that is not too tart and a little sweeter. Our standard Top Shelf Lime Margarita mix is really good but the Ultra Premiums are better. Don't Like High Fructose Corn Syrup? Use our Top Shelf Pure Cane Sugar Lime Margarita mix with real lemon/lime juice for only $15.00 extra. Visit our Mix page to view all of our various bar mixes and slush mixes that are available. We also have some great recipes. Our process: One of our frozen beverage experts will deliver the machine to your location and set it up the day of your event. We will mix the first batch for you and show you how to mix additional batches if needed. If you are having a large party of 100 people or more we recommend making a 2nd batch and topping off the single machine OR renting our Taylor 430. We leave an extra mix just in case you need it and it is only charged to you if you use it or break the seal. Each additional mix is only $20.00 or $35.00 for real fruit mixes. The real fruit mixes taste awesome virgin or with alcohol. "Extra" real fruit mixes must be prepaid and are NOT refundable. We supply everything you need to make your party or event the talk of the town including premium mixes, cups, frozen drink straws, and margarita salt. Pick a fitted skirt for the cart to match your party theme. Our competitors do not even offer professional cloth skirts to cover the cart like us. We have many print and solid color skirt choices. Machine rentals are for one day. When your party or event is over we come the next business day to pick up the machine and clean/sanitize it for the next rental. It doesn't get any easier than that. All of our machines are late model and well maintained. Do you need a TABC certified bartender/server for your event? Ask us for contact information to book this service. The best machine to rent is our commercial dual frozen drink machine because you can have a virgin mix (slush) on one side for the kids and an alcohol mix on the other side for the adults. Our dual machine holds 3 gallons on each side and is refillable. Our large stainless steel bowl machine in the picture below holds 6.5 gallons of your favorite beverage. This machine is refillable. 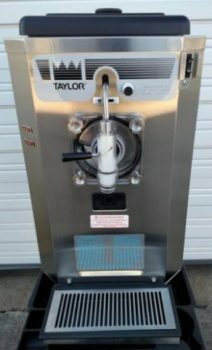 Our fastest machine is the Taylor 430 frozen drink machine. This machine is great for large parties that will have over 100 guests and need high production. This machine works great for events with a short serving time, it can keep up with the demand. This machine has a freeze time of approximately 15 minutes. * Please take note that we do not allow our frozen drink machines to be transported from the delivery address. We did not invent the margarita machine rental business, we just perfected it. It brings us great pleasure to be innovators in the business and see others copy our style. We guarantee you a top-notch working machine. Our large stainless steel bowl machine holds 6.5 gallons of your favorite beverage. The freeze time is approximately 45 minutes. The Low Mix Light tells you when to refill the machine to keep a constant supply of product for those large events. This machine is refillable. Machine rental is $125.00 and includes 1 mix, mixing container, instruction sheet, and a 25 ft. extension cord. A salt rimmer and margarita salt is provided for lime margaritas only. The best machine to rent is our commercial dual frozen drink machine because you can have a virgin mix (slush) on one side for the kids and an alcohol mix on the other side for the adults. Our dual machine holds 3 gallons on each side and is refillable. The freeze time is approximately 60 minutes. Machine rental is $160.00 and includes 2 mixes, 2 mixing containers, instruction sheet, and a 25 ft. extension cord. A salt rimmer and margarita salt is provided for lime margaritas only. Machine requires a dedicated 20 Amp circuit. Machine draws 17 amps. Our fastest machine is the Taylor 430 frozen drink machine. This machine is great for large parties that will have over 80 guests and need high production. This machine has a freeze time of approximately 15 minutes. Machine rental is $160.00 and includes 1 mix, mixing container, instruction sheet, and a 25 ft. extension cord. A salt rimmer and margarita salt is provided for lime margaritas only. Machine requires a dedicated 20 amp circuit. Machine draws 16 amps.